While I am indeed a proud South African I do like to absorb popular traditions from other corners of this globe. And since Halloween just also happens to be my birthday, I thought I’d give the fun customs of Halloween a stab (pun absolutely intended). Here’s how I go about figuring out how to carve some pumpkins. While orange and black are the traditional colours of old hallow’s eve, I went for fresh, white pumpkins to fit in with the throws of a southern hemisphere summer as halloween doesn’t coincide with autumn for us. 1. First things first, cover your table or work surface in plastic or newspaper, it’s about to get a bit messy. 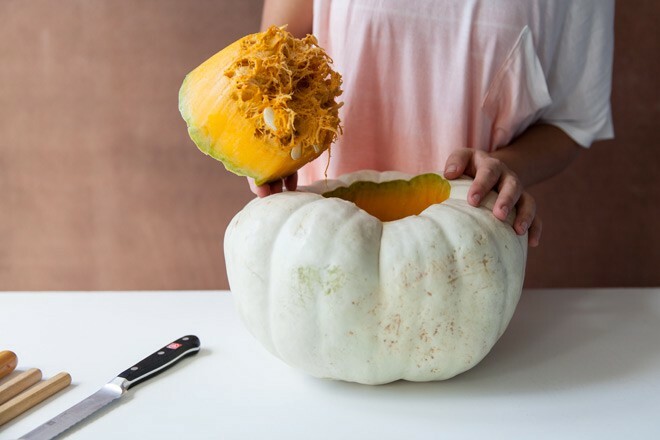 Draw a circle around the stem of your pumpkin, large enough so that you have room to work inside, but not so large that you can clearly see the cut out if you look at the pumpkin head on. 2. 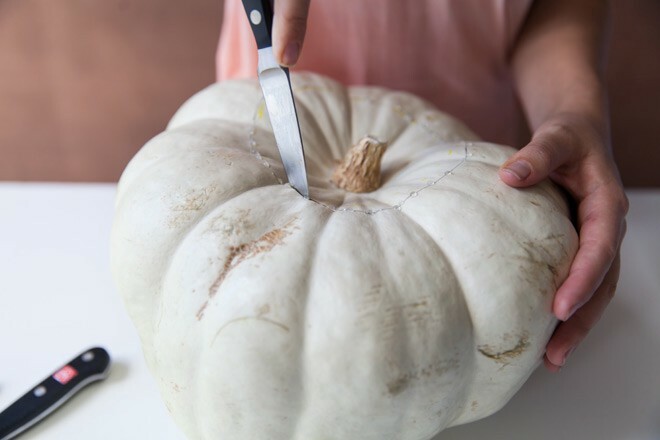 Use your sharp paring knife to cut into the pumpkin and then the flexible bread knife to start sawing your way around. Easy does it. There’s a lot of resistance so try to saw slow and steadily, and away from you, when possible. 3. 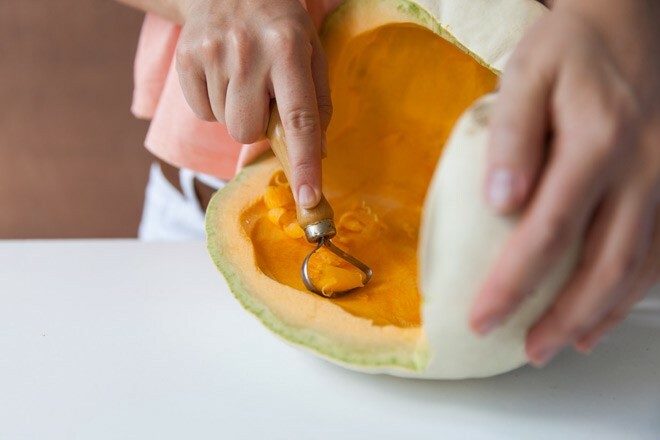 Be sure to cut down as far as possible to sever the inside pumpkin strands, otherwise you’ll have a nice tug of war on your hands, getting that gaurd-y lid out. 4. With a sharp sided spoon or a carving tool, scrape loose the pips and stringy bits and scoop them out into your scraps dish. If you’re not squirmish, go ahead and use your hands to dig out the excess. And if you don’t mind the extra PT, you can save these scraps for later as well. If you separate the pips from the stringy bits and rinse them off, they’re fit to be roasted in olive oil and taste delicious in salads. 5. 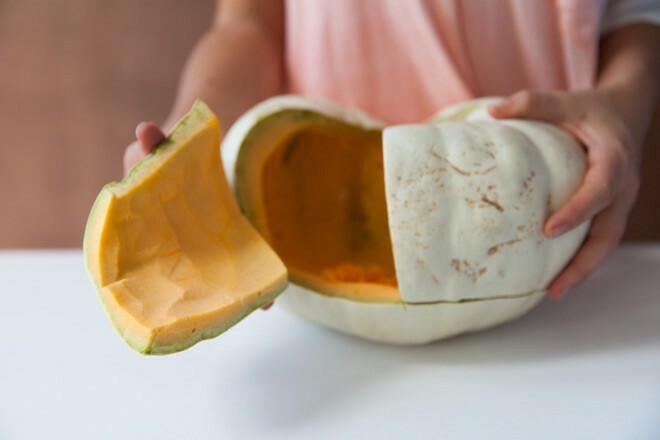 Cheat tip: Now, to make it easy, I opened up the back of the pumpkin to give myself some space to work with. Cut down the middle from the circle you’ve just cut and then again down the outer sides of the circle and all along the bottom. This should release two, square shaped doors. Set them aside — we’ll put them back later to contain the candlelight. 6. Next use a scraping tool or your sharp-edged spoon to gradually scrape out the inner pumpkin filling. 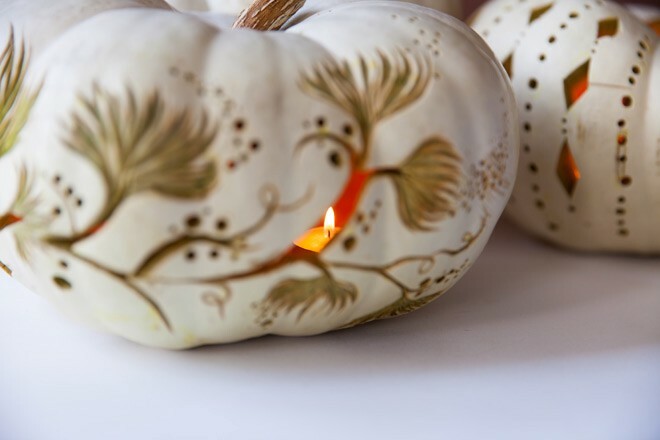 You only have to scrape down the wall that you’ll be carving out so that the width to cut through is manageable, and the base of the pumpkin is even, so the tea lights sit lower than your design. You’ll want to keep your scrapings in a container for later fritter or pie making. 7. 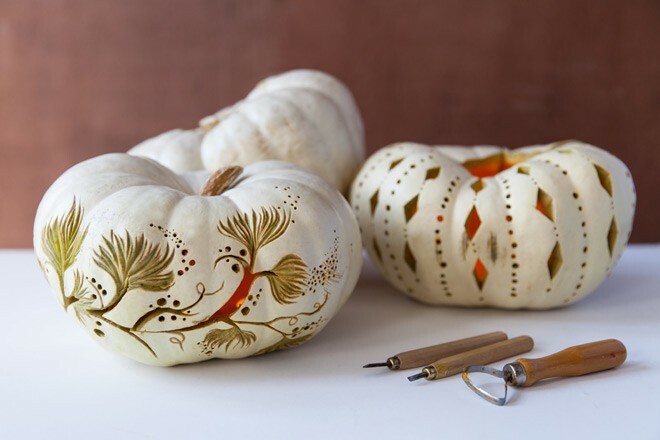 Once your pumpkin walls have been considerably thinned (to about 2 cm), you can work on the design. If you’re drawing free hand, use your marker to create some guidelines on the face of the pumpkin. 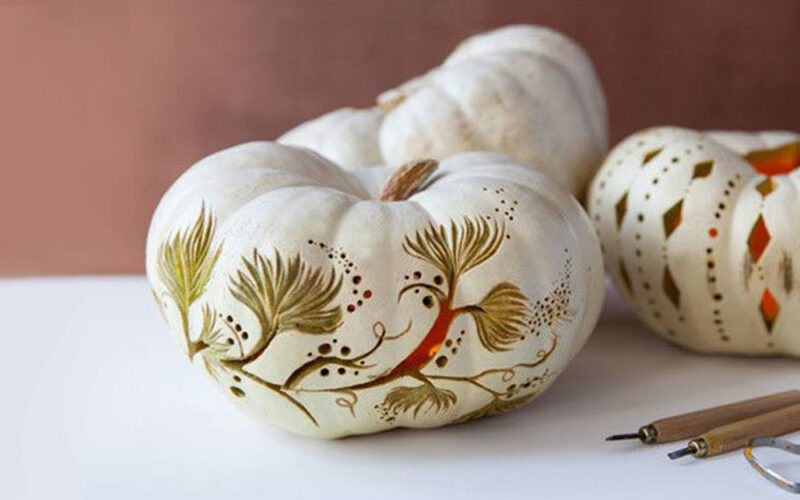 If you’re working from a print out, tack this to the front of the pumpkin and use thumbtacks or a serrated pizza wheel to trace along the lines of your drawing thereby imprinting the pattern on the face of the pumpkin. 8. 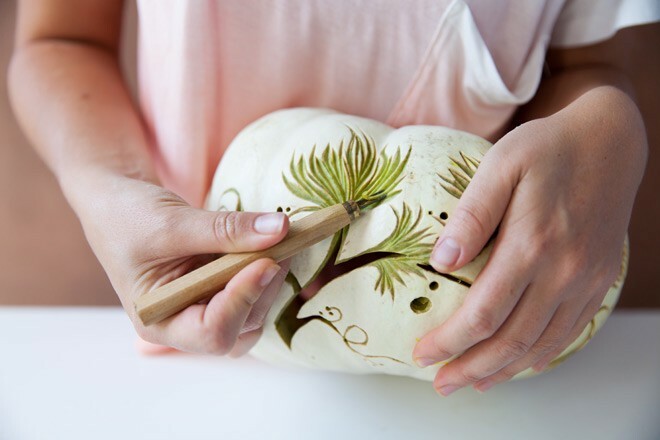 Now you can use the lyno tools, sharp knives or disposable hand saw blades to start carving or sawing out the pattern you’ve drawn. It’s nice to alternate cutting out detail for the light to shine through and carving out bits to add some depth. 8. I used a leaf-like pattern for one pumpkin and a diamond, harlequin pattern for the second pumpkin. Geometric patterns are easiest to cut out as cutting out organic curves is hard to master with finesse when you’re basically stabbing a vegetable. A drill comes in really handy for creating even sized and spaced holes in your design. Be warned your work space will be showered in tiny pumpkin cork screws so chose your work area carefully. 9. When your design is finished, insert pins into the back bottom ridge where you cut the ‘doors’ out and slide the square doors from the top down back into place over the pins. Then place some tea lights in and wait for nightfall. You can throw the pumpkin scraps onto your vegetable compost heap so the worms can have a feast too. Here’s a tasty recipe for legit pumpkin pie to put all those carved inside bits to excellent use. Be sure to only carve your pumpkin a day or two before Halloween as they’ll only look pretty for about a week, after which these too will need to join the compost heap. 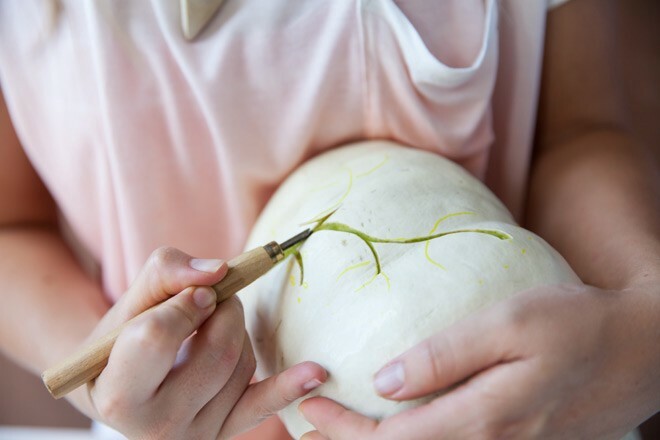 If you’re carving a pumpkin for Halloween this year, share your pics with us. 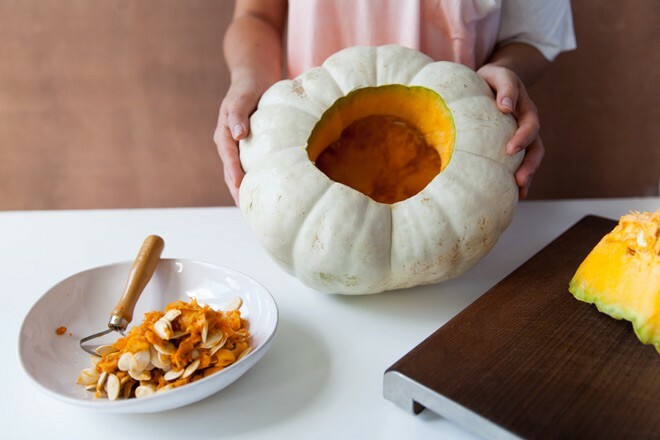 We’d love to see how inspired you can get with some food and a scarily, creative tradition. Pumpkin carving technique and design by me (with the scars to prove it).